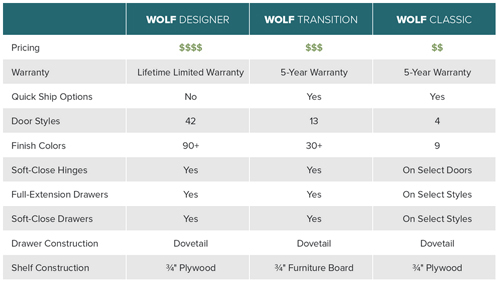 Wolf Home Products is an innovator in the building products industry. They've cultivated more than 170 years in business into a total satisfaction guarantee. With their vast inventory of kitchen and bath, outdoor living and building products, They deliver your orders in a fraction of the time and ensure you get unparalleled value when and where you need it. Wolf stands behind our service because, above all, Wolf stands behind you. Wolf sources products that deliver exceptional performance at very attractive prices. These branded and private label products provide our customers with a wide selection of the most popular features, styles and colors, enhanced margin opportunity, and the ability to stand out in an over-cluttered marketplace. Wolf is committed to maintaining the highest level of reliability across the entire supply line. This means shorter, more predictable lead times for our dealers and their customers. Our staff handles 350,000 customer calls annually and has demonstrated a 99.95% error-free rate to customers. Customers also benefit from Wolf’s unique policy: Every Wolf employee is empowered to resolve customer problems – within 24 hours – in a manner that is satisfactory to the customer. Choose the color, style, accents and accessories you want – without compromise. 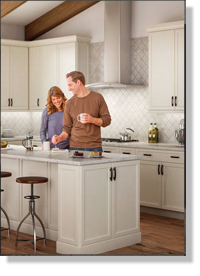 With nearly 50 door styles, 100 finish options and a wide array of decorative and storage solutions, all the details come together and bring your story to life. 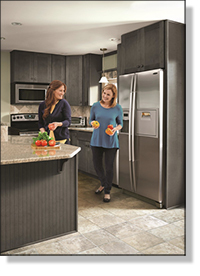 Wolf Transition makes it easy to design the perfect kitchen to make anyone feel right at home. Available in a wide range of affordable door styles and finishes, Transition provides quality construction, more storage and easier access. 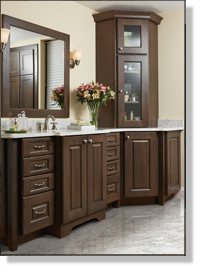 Wolf Classic cabinets offer great style and practical storage to make your dream a reality. Quick shipping can make it come true sooner than you imagine. © 2017 Kitchen Innovations All rights reserved.